In Sweden, birthdays and name days of some members of the Swedish Royal Family are official flag days. For example, the name day of King Carl XVI Gustaf of Sweden is celebrated on January 28. Carl Gustaf was born on April 30, 1946 to Prince Gustaf Adolf, Duke of Västerbotten, and Princess Sibylla of Saxe-Coburg and Gotha. His father never ascended the Swedish throne because of his death in an airplane crash in 1947. Carl Gustaf became Crown Prince at the age of four and ascended the throne at the age of 27 upon the deaf of his grandfather, Gustaf VI Adolf, adopting “For Sweden – With the times” (För Sverige – i tiden) as his motto. Although King Carl XVI Gustaf was born on April 30, his name day is celebrated on January 28. Sweden has its own name day calendar adopted by the Swedish Academy, in which almost every day of the year has a corresponding name. The current name day list was adopted in 2001. Although it has no official status, many people in Sweden celebrate their name day. Name days of the king, the queen, and the heir apparent were officially proclaimed flag days. 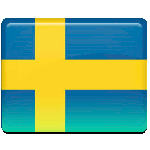 On flag days, the national flag of Sweden is flown on all public flagpoles and buildings from sunrise to sunset. However, flag days are not public holidays. They are ordinary work days unless falling on a weekend.